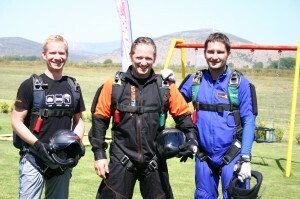 Another summer weekend in Greece and we greet once more Stephan, Marcus and Marc for a short skydiving trip. The guys are unstoppable when it comes to jumping while having a lot of fun! Its good to see them back and we are amazed by the development they have gone through in the past months. Due to the frequent jumping, they have learned so much already! This is very efficient progression! Good job!